From Summerfield to Melrose Springs, Harold "The Great Gildersleeve" Peary is back in an all-new role! As "Honest Harold" Hemp, he's a radio personality extraordinaire, crooner de la cr�me, and idol of all the ladies -- at least in his own mind. 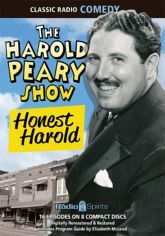 Co-starring Jane Morgan, Cathy Lewis, Olan Soule, Joseph Kearns, and Gloria Holliday, here are sixteen warm and funny episodes of The Harold Peary Show, produced and directed by Norman Macdonnell.